January 2015: new members of Azov take an oath of allegiance in Kyiv before setting off for the front. (c) Sergei Chuzavkov / AP / Press Association Images. All rights reserved.The past 18 months have seen Azov gain a reputation as disciplined (and decisive) patriots in Ukrainian society, which is increasingly tired of war and dissatisfied with the country’s dire economic situation. Indeed, the economic crisis, international politics and particularly the war in the east have given the government prime justification to carry out reforms in service of demolishing the remains of the social state. In this situation, there is room for the Ukrainian right right to make political headway, particularly on “social issues” such as rising tariffs, pensions, welfare and unemployment. Yet Azov has never come out openly against the Ukrainian government and its austerity reform policies. Though the battalion’s base is considered to be Mariupol, located on the Azov Sea (hence the group’s name), its core group hails from the city of Kharkiv in eastern Ukraine. And Azov’s close connection to Arsen Avakov, Ukraine’s present interior minister and the former governor of Kharkiv region in the mid-2000s, guarantees their loyalty to the authorities. 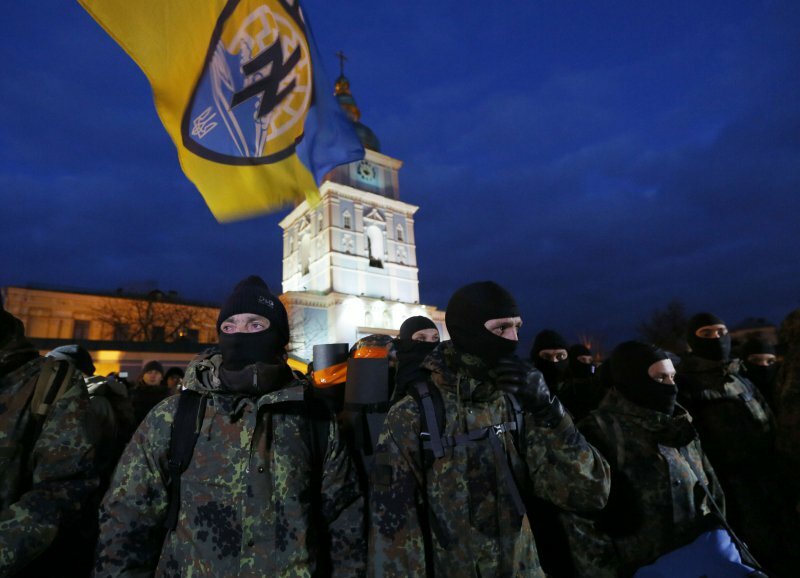 Azov's numbers have swelled not only at home, but also from abroad. A story has been popular in Ukrainian social networks about Mikael Skillt, a Swedish neo-Nazi who came to fight for Ukraine. Azov also has a relatively large number of Russian members — and 19 January revealed the extent of their influence. 19 January: Azov activists disrupt anti-fascist commemoration in Kyiv. 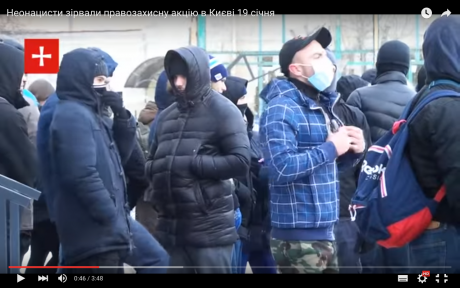 Screenshot taken from YouTube.However, the demonstrators at Zhovten were confronted by an ultra-right group led by Roman Zheleznov. Zheleznov, a Russian neo-Nazi who served a prison sentence in 2013 for stealing two kilogrammes of marbled beef from a supermarket, emigrated to Ukraine in 2014 to fight with the Azov battalion. He is also the former ideologist of Russia’s “Wotan Jugend” group, which regarded Adolf Hitler as their sole leader. How important is a purely symbolic victory over the left for Azov, especially at the cost of increased media and public attention? The reaction of the commander of the Rusich neo-Nazi combat unit, which is fighting on the side of the separatists in the so-called “Donetsk People’s Republic”, is even more interesting. Aleksei Milchakov, a Russian citizen previously known for his sadistic killing of dogs, was full of praise for Zheleznov’s actions, and called for the anti-fascists to be dealt with. Azov has much in common with these pro-Russian combat groups, including the presence of Russian neo-Nazis who may be fighting for opposite sides in the conflict yet are allied in their general view of the world. March 2015: Azov fighters at Shyrokino, Mariupol. (c) Mstyslav Chernov / AP / Press Association Images. All rights reserved.This kind of “internationalism” is, of course, typical of more than just Russian passport holders. “Native” Ukrainians also buy into the thesis that the current conflict is a “fratricidal” war unleashed by Jews with the aim of setting Slavs against one another and enslaving them. One such proponent is Vita Zaverukha, a neo-Nazi who served in the Aidar volunteer battalion. Zaverukha is now in pre-trial detention accused of robbing a petrol station and killing two police officers. She is one of the “patriots, persecuted by Poroshenko’s Jewish regime” that are mourned by the ultra-right. 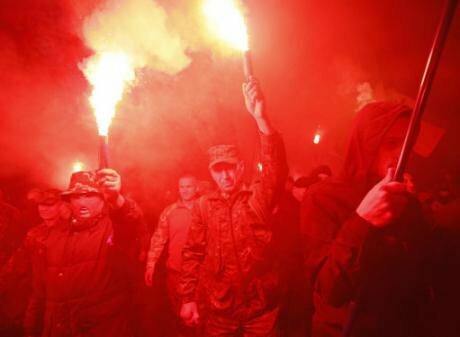 October 2014: Azov celebrates 72nd anniversary of the creation of the Ukrainian Insurgent Army in Kyiv. (c) Sergei Chuzavkov / AP / Press Association Images. All rights reserved.It must be said that, until recently, Azov has been extremely careful to project a “respectable” image. The group’s leaders actively used symbolism and rhetoric that, while unambiguous within its own ultra-right subculture, meant little to Ukraine’s public at large. 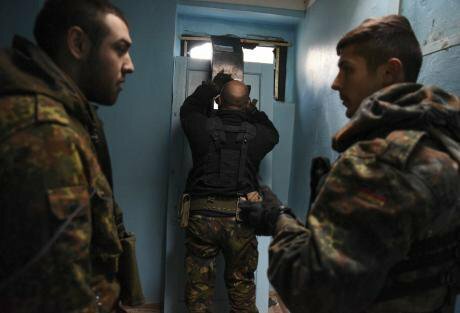 The battalion’s leadership has also distanced itself from a solidarity campaign with Ukraine’s numerous “patriotic political prisoners”. And Azov didn’t even join the attacks on Kyiv’s May Day marches and LGBT Pride. So why have they decided to reveal their true political colours now? But now, according to a number of recent statements, Azov’s leaders are determined to extend their representation in Ukraine’s parliament. To succeed via either the bullet or the ballot box, Azov needs to gain the loyalty of the majority of far right constituency, which are now roughly split into two camps. While Azov and the groups who share its views are linked to Avakov (hence their guarded attitude to any pronouncements against, or simply unfavourable to, the current government), the other bloc consists of Right Sector and the smaller groups aligned with it. The final factor in the rise of Azov is the political infighting over the government led by Prime Minister Arseniy Yatsenyuk. In the unending struggle for power between Yatsenyuk’s team and that of President Petro Poroshenko, Interior Minister Arsen Avakov is largely on the PM’s side. It is quite possible that the recent rise in Azov’s profile is linked to Avakov’s desire to persuade the president that he alone is capable of keeping Biletsky and his adherents under control, and that the fall of the Yatsenyuk government could have unforeseen consequences. But is that really the case? The opposite is more likely to be true: the presence of patron in the cabinet is the main factor that has given Azov its privileged position within the far right. However, the further Ukraine’s government pushes austerity policies and neoliberal reforms, the more likely we are to see a growth in support for a hypothetical “strong arm” — one that would end corruption and defend the privileges of ethnic Ukrainians.